Grumpy Cat isn’t Mr. Lashes’ only famous client. He also represents Keyboard Cat, Nyan Cat (the rainbow pop tart cartoon cat), Mike Tyson’s face tattoo and Ridiculously Photogenic Guy. 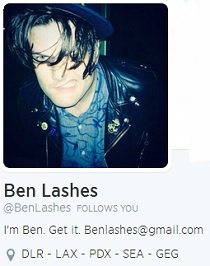 Lashes’ job title isn’t exactly run of the mill either: meme talent manager. We can only imagine how many women have rolled their eyes in bars, conferences and elsewhere when Lashes has presented himself to them as such. The AU piece links to some Mashable video about Lashes, a longtime former rock’n’ roller, for the site’s ongoing series “That Was Me.” On this Thursday, the video ranks in our humble opinion as must-see Internet TV.